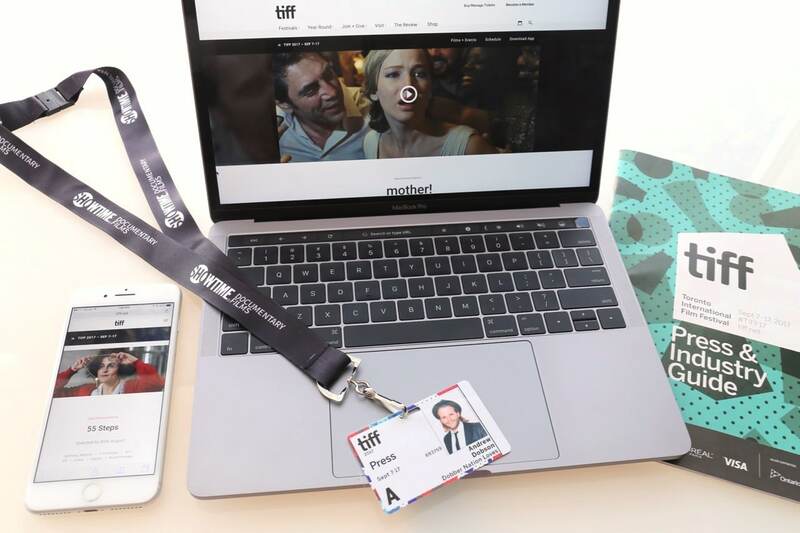 Each September the Toronto International Film Festival keeps movie media in Canada’s largest city busy as a swarm of bees. I’ve been an active supporter of the festival for over a decade. My first TIFF experience was in 2004 when I stood in a slew of rush lines and watched a collection of quirky foreign films. I became an instant fan of the festival, spending the next several years volunteering at the gala’s which screen at Roy Thompson Hall. In 2013 I had the pleasure of covering the festival for Metro Newspaper, which had me up all hours of the day as I screened films, attended press conferences, skipped around to gifting lounges and acted as a fly on the wall at exclusive celeb-infested parties. This year I challenged myself to an epic movie marathon. My goal? To see as many films as I could, with the caveat that I would get at least 6 hours of sleep a night (success! ), only eat healthy food (prepped kale salads and fruit cups good to go), and focus my time on screenings rather than trying to also tackle parties and pop-ups (it’s handy that I now have a choir of writers who are ever so keen to sip Moët & Chandon for me). For any of the movie buffs out there wondering how film critics see so much in so little time…let’s just say it helps to have a Type A personality, enthusiasm for iCal scheduling and fully charged tech. As soon as TIFF announced its full schedule I spent two days reading each synopsis for the festivals 255 features. This year my goal was to review films that focus on the LGBT community, female empowerment, stories about disability and top comedies (over the years I’ve learned it’s important to throw in a laugh once and a while so my tear ducts don’t dry up). After creating a shortlist of films I most wanted to see I then reviewed the Press & Industry screening schedule and marked each film in my iCal. Having my film schedule already organized meant I could easily reference the films I’d be seeing each day on my iPhone, while also offering flexibility to switch things up based on the festival buzz being offered up by fellow critics (we like to gossip about what’s good while waiting in line). Each day I woke up at 6am. Sipped a Nespresso (or two). Got caught up on emails. Scheduled my film reviews for the day via Twitter and Facebook. Hopped on my bike at 8am and peddled to Scotiabank Theatre for my first screening. Most days I was watching four to five films back-to-back. I’d peddle back home around 7pm to prepare a quick meal and write reviews for the films I had screened that day which typically had me nodding off at midnight. If I found the time, I’d try and touch my toes and call it yoga. Display: 13.3 inch LED-backlit display supports millions of colours which makes editing film party photos and watching Youtube trailers a feast for the eyes. Storage: 512GB flash storage offers tons of space for saving music, video, photos and essential docs. Processor and Memory: the 3.1 GHz dual-core Intel Core i5 with 8GB onboard memory means managing a handful of applications at once is a breeze. Battery: I was wowed that I never had to charge my laptop during the day. The Macbook Pro offers up to 10 hours of wireless web surfing so even on a particularly busy work day you can feel confidant in leaving your power adapter at home. Connections: the newest iteration of the Macbook Pro has streamlined ports (now featuring a 3.5mm headphone jack and four Thunderbolt 3 Ports which offer up to 20 Gbps). I was skeptical about how easy it would be to connect my camera, iPhone, external monitor, speaker system and power adapter but was quickly converted thanks to multi-pronged dongle. I actually have less cords slithering around my work desk now which is a real win for the aesthetics of things. Touch Bar: Macbook Pro’s new Touch Bar has decluttered the keyboard and now gives you quick access to commands. Now you can easily adjust volume and brightness, launch a conversation with Siri, answer your iPhone or Facetime call….all without every having to move your cursor. Touch ID: you can now unlock your Mac in an instant with the quick press of your finger. Use Apple Pay to secure online purchases. Quickly access system settings and locked notes. And even switch between users if you’re using a shared computer. macOS High Sierra: this week Apple launched its fresh OS which will introduce new core technologies that improve important functions of your Mac. From re-architecting how it stores data to improving the efficiency of video streaming.